Can I Cancel a Credit Card With a Balance? Can I Cancel a Credit Card & Slowly Pay Off the Balance? Closing credit cards helps you avoid accumulating too much debt, eliminates unnecessary fees and makes you less vulnerable to identity theft. It also can help you avoid interest rate hikes. On the downside, your available credit decreases, which can have a negative impact on your credit score if you have balances on other cards. You can close, or cancel, a credit card even if you have a balance on the card, though you will want to pay the balance eventually. Under the Credit Card Accountability Responsibility and Disclosure (CARD) Act, your credit card company can't make you pay the outstanding balance immediately after you cancel the account. If you opt out of proposed changes in the account, the card company is permitted under the CARD Act to either require you to pay off the balance in five years or double the minimum payment. This may result in a faster payoff than under the current terms of your account. Your interest rate won't rise when you close an account. The CARD act prohibits credit card companies from increasing rates on existing balances. Your company can only increase rates on new purchases and it must give you 45 days advance notice so that you can opt out and close the account. If you have closed the account, you won't have new purchases that can be subject to higher rates, anyway. Closing credit card accounts can actually hurt your credit score. Fair Issac Corporation, or FICO, bases 30 percent of your score on the ratio of your balances to your available credit. By closing cards, you lower the credit available to you. CreditKarma recommends that you try to keep four to six cards open. If you must, consider closing newer accounts and those with the highest interest rates and fees -- especially if you're not using the card. According to CreditKarma, canceling your oldest cards could make your credit history appear shorter. FICO bases 10 percent of your score on the length of your credit history. How do I Negotiate a Settlement With Sears? 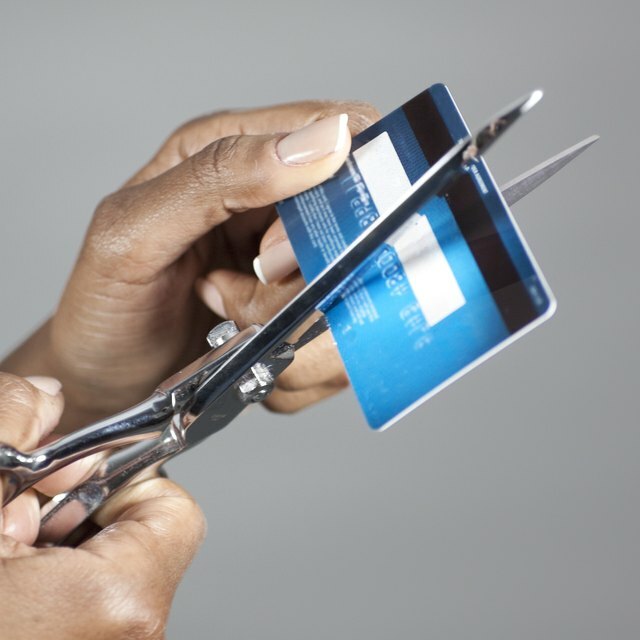 How Can I Cancel My Credit Cards Without Hurting My FICO Score? How Does Having Unused Credit Cards Hurt Your Credit Score? Does Requesting an Increase in Credit Line Affect My Score? Simply cutting or shredding your cards does not cancel them. Depending on your agreement, you need to request account closure by phone or in writing. Follow up by verifying that your credit report shows the account is closed. You get one free credit report a year from each of the credit reporting agencies through AnnualCreditReport.com. MyFICO.com: Credit Report Questions and Answers: Will Closing a Credit Card Account Help My FICO Score?